On a cool, rainy day in Zambia’s Copperbelt, I observed one of our honey weighing and purchasing days with our village partners. Luankuni is located 40 kilometers south of Kafakumba where our offices and processing facility is located. It is in a remote area not easily accessible by car or truck. Twice a year a Bee Sweet team helps to harvest our 100% organic honey. The honey is then stored in a specially-constructed storage facility until we arrive to purchase it directly from the partners. Each partner’s honey is in sealed buckets, marked with their name, location and hive number. On this day Edwin, the mentor for this project, met us as we arrived in a car and a flatbed truck. Edwin was elected by his fellow village neighbors to serve as the project mentor and act as the link between Bee Sweet and this location. Our mentors are paid a percentage of the revenue generated from the honey collected under his leadership. By the time we arrived, he had assembled the farmers around the honey storage depot waiting on our arrival. 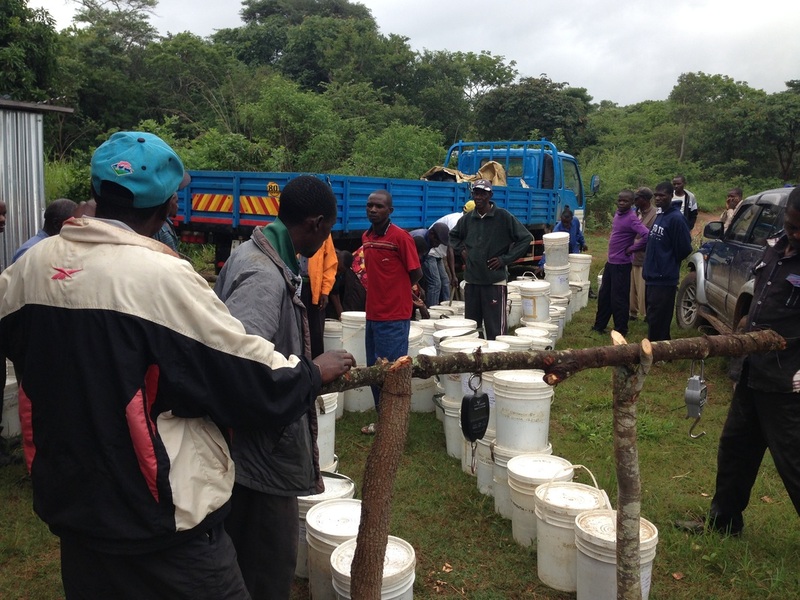 The Bee Sweet team quickly set up a weigh station and began weighing each bucket. Then the team paid each farmer directly in cash. These are some of the poorest people in the world. They earn about $80.00 per person, per year with very little opportunity for supplemental income. With Bee Sweet, however, our partner farmers can earn approximately $55.00 per year additional income by participating at the minimum level of 5 hives. She will do better as we move her up to 15-20 hives in the near future. Last May, as an alternative to cash, we offered solar powered lights. This efficient, modern, easy-to-use light illuminates the farmer’s dark hut. In the future, we plan to offer corrugated sheets for waterproofing huts and energy efficient stoves to reduce the use of charcoal and smoke creation in the hut while cooking. (Respiratory illness is very common for the village women) Other options that are being explored include bicycles for transport to the nearest commercial district, which is 12 miles away, as well as other useful items otherwise not available to them. As the technology becomes available, we plan on opening mobile banking via cell phones to reduce the actual cash that is distributed which potentially endangers the villager from thievery. Bee Sweet is making a direct impact on the lives of Zambian farmers through our self-sustaining, for-profit business model. Our approach isn’t about "teaching a man to fish," as much as it’s about "go fishing with them." With over 62,000 bee hives in the bush and working in over 80 locations, we are gaining momentum towards an even greater impact.